The University of Alberta EcoCar Team is delighted to announce that Toyota Canada Inc. will be joining the team as this year’s Exclusive Automotive Sponsor. Ever since the team’s creation in 2010, participating in the Shell Eco-Marathon has given the team not only an opportunity to push the boundaries of energy efficiency but also the chance to explore and build perspectives on how to tackle some of the world’s biggest challenges. ALICE goes to Telus World of Science! We were once again out in the community with ALICE as part of celebrations for the inaugural International science center and science museum day at Telus world of science Edmonton. Team members were also on hand to share with excited students and their families,the technology behind ALICE and also their experiences competing at the Shell Eco marathon. Original content by Madeleine Cummings, Edmonton Examiner. A team of students from the University of Alberta is taking their hydrogen car to London to compete in Shell’s “Drivers’ World Championship” on July 3. 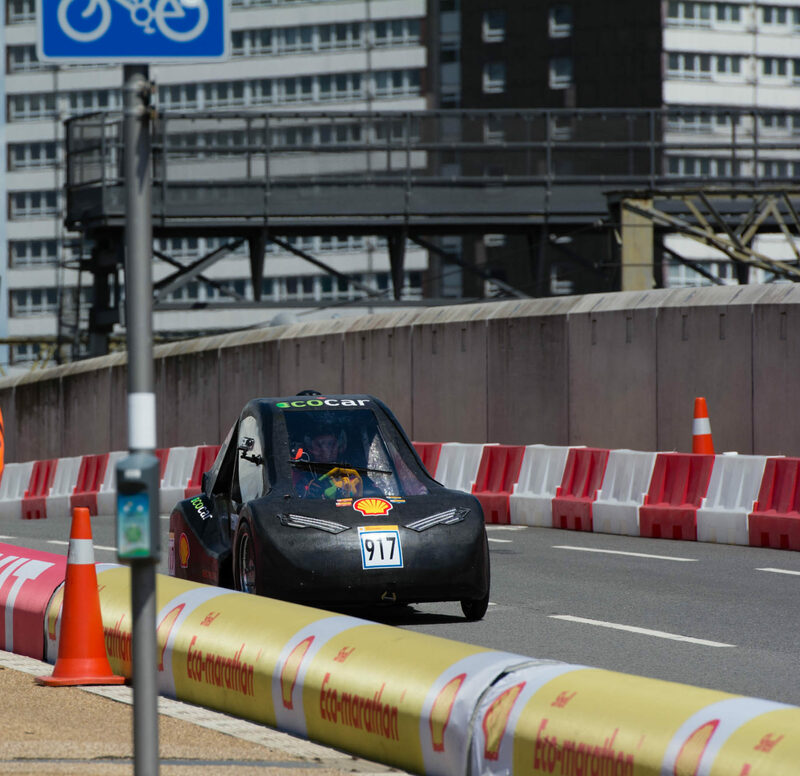 Student teams from Europe, Asia and the Americas will compete at the event to see who can travel the fastest and be the most fuel efficient over the course of a 17.9-kilometre race at the Queen Elizabeth Olympic Park. The team qualified for the first-ever international iteration of the Shell Eco-marathon series by winning their category at a competition for teams in the Americas held in Detroit this past April. Not only did the U of A team receive first prize in their hydrogen urban-concept category, but they managed to be the only team to complete the course. (They took several attempts to do it, but successfully completed 10 laps of the track four times.) Hydrogen is tricky to worth with and the two other teams in their category either did not make it through technical inspection or had a technical failure during the race. Since the eco-car team formed at the U of A in 2010, students have created two urban-concept cars, the second of which is being raced this year. Students have spent hundreds of hours working on this car, which is funded by sponsors and the university. There are currently about 40 students working on the team, but just over a dozen will travel to London. The race track in Detroit was only 9.6 kilometres, so students have had to make adjustments to the car — named Alice — to accommodate a much longer ride. They adjusted the drive train and reduced the car’s weight by finding a better material to use for its windows. They also designed an app, new this year, that will allow the team to communicate with the driver, monitor the car’s systems remotely and see a live feed from cameras positioned in the car. Nikola Viktorov, a third-year chemical engineering student who is the team’s captain and driver for the competition, said he is most looking forward to learning from other teams there. “The European teams generally have gotten a lot better efficiency scores than we have,” he said. “I think being able to talk to them and see how they approach all the challenges will be very valuable for our team.” The winning team will be invited to spend a week with Scuderia Ferrari at their Italian factory. The Shell Eco-marathon Drivers World Championship will take place on July 3 at the Queen Elizabeth Olympic Park in London. An EcoCar created by engineering students at the University of Alberta recently won the Shell Eco-Marathon Americas, a competition for clean-car technology. The curvaceous, 300-pound car — nicknamed “Alice” — runs entirely on hydrogen fuel cells. The University of Alberta’s Eco-Car team is headed to London after winning its division at the Shell Eco-marathon Americas competition in Detroit last week. The 40-member team and their sleek carbon fibre car, dubbed “Alice,” took first place in the UrbanConcept category for hydrogen-fuelled vehicles last weekend. Alice will be competing in the Shell Eco-Marathon Americas competition. The concept car, created by a 19 member team, is called Alice and will be competing in what is considered the most challenging group, the Urban Concept-hydrogen fuel category. The team is led by Nik Viktorov, a third-year chemical engineering (co-op) student, who says that the team has high hopes for the vehicle. If they come in one of the top two spots, they will be eligible to enter the Shell Eco-Marathon race in London, England this July. (Edmonton) When you take care of a lot of tiny details, it adds up to something huge. And the U of A Eco-Car team is having a really big year. This 19 team members—a record number—are in Detroit, competing against universities from around the world.